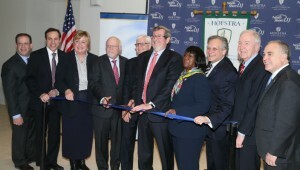 The Hofstra North Shore-LIJ School of Medicine today unveiled an ultramodern 63,000-square-foot addition and announced it has earned full accreditation, signaling the start of a new era as the charter class prepares to graduate this spring. The new building features a soaring, sun-filled atrium and state-of-the-art facilities, including a 7,300-square-foot structural anatomy lab. It more than doubles the size of the medical school. Full accreditation by the Liaison Committee on Medical Education (LCME), which accredits all medical schools in the United States and Canada, means Hofstra North Shore-LIJ School of Medicine and its innovative approach to medical education meet strict national standards for structure, function and performance. These critical milestones come as the charter class prepares for Match Day on March 20 (the first in school history) and commencement in May. Match Day is when students learn where they will perform their residencies. Today’s grand opening and announcement are the culmination of a process that began more than seven years ago – in October 2007 – when Hofstra University and North Shore-LIJ Health System announced plans to partner and open the first allopathic medical school in New York state in more than 40 years. The original medical school building, formerly the home of the New York Jets training facility, opened in 2010. Construction of the new, two-story addition began in June 2013. The estimated cost of the project is $35.9 million, $14.5 million of which was provided through $25 million in New York State Economic State Development Corporation grants secured by Hofstra University in 2008. 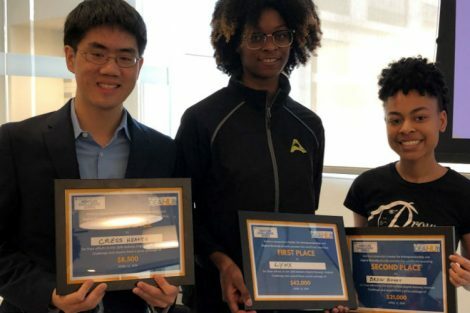 The grants were sponsored by the New York State Senate delegation, led by Majority Leader Dean Skelos and State Senator Kemp Hannon. A portion of the 2008 grants was used to renovate the original medical school facility. The $21.4 million balance for the new building was financed through bonds issued by the Town of Hempstead Local Development Corporation. 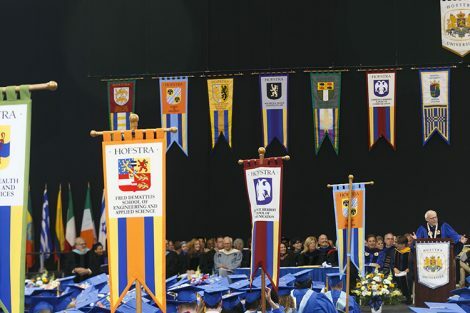 Nassau County Executive Edward P. Mangano, who earned his bachelor’s and law degrees from Hofstra, noted the economic impact of the medical school. “I welcome Hofstra North Shore-LIJ School of Medicine’s expansion which will provide educational and employment opportunities for Nassau’s growing health care economy,” Mangano said. Town of Hempstead Supervisor Kate Murray said the expansion of the medical school positions the region well to answer the demand for health care professionals. The Association of American Medical Colleges projects a physician shortage of 130,000 by the year 2025. “Jobs in the medical field are among the fastest-growing occupations in the nation, and Hofstra University is demonstrating its unwavering commitment to preparing students for the future, and placing many highly trained young professionals in the workforce,” Murray said. “Congratulations to Hofstra University and the North Shore-LIJ Health System on the completion and opening of this new and improved Hofstra School of Medicine,” she said. Paul O’Rourke, executive vice president of EW Howell, the construction manager for the project, noted that several Hofstra alums work for the firm. EW Howell has worked on several other Hofstra projects, including the Netherlands and Graduate residence halls. 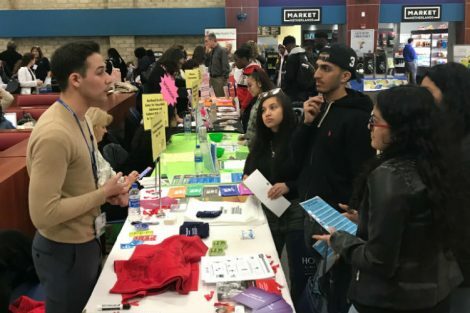 “We have a long history with Hofstra, and to see Hofstra become a premier medical school with North Shore-LIJ, to be a part of something that keeps attracting great students to come to Hofstra – that is what makes me really proud,” O’Rourke said. John D. Cameron, Jr., managing partner of Cameron Engineering & Associates, LLP noted that the building incorporates environmentally friendly design standards that will reduce its carbon footprint.